Collagen is the main structural protein in connective tissues, and can be found in areas like your tendons and ligaments; this makes collagen important to maintaining proper joint health. You might be asking, why not use collagen supplements? Plenty of companies out there are selling collagen after all, but collagen is an incomplete protein source, and simply supplementing collagen does not increase collagen in the body. Passion Fruit Seed Extract has been shown to increase collagen production in new studies in animal models (1). 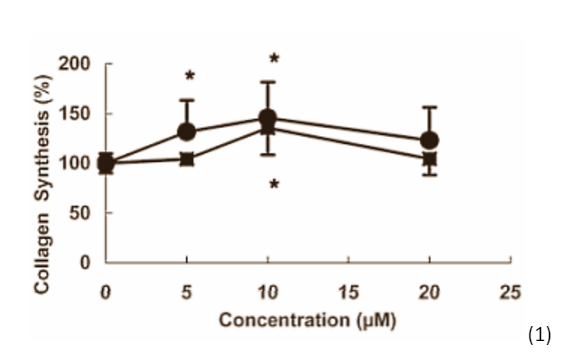 The graph below shows the effects of passion fruit seed extract on collagen synthesis (circles) vs. a polyphenol found in wine known as resveratrol (squares). Research suggests the key active in Passion Fruit Seed extract may activate bone regrowth while simultaneously reducing inflammation (2, 3). Passion fruit seed extract selectively inhibits COX-2 sites in-vitro, a mechanism researched for inflammation reduction (2). Passion fruit seed extract also significantly induces differentiation of osteoblasts in-vitro. This could lead to osteoblast maturation and differentiation, so in layman’s terms, bone regrowth potential (3). Passion seed fruit extracts may be be the first natural ingredient to actually increase in collagen synthesis, bone regrowth, and a reduction in inflammation. Further research is needed to see, but the in-vitro and animal data seems very promising. PFSE will likely become a popular component in joint products in a category that severely lacks innovation. 1. Matsui, Yuko, Kenkichi Sugiyama, Masanori Kamei, Toshio Takahashi, Tamio Suzuki, Yohtaro Katagata, and Tatsuhiko Ito. "Extract of Passion Fruit (Passiflora Edulis) Seed Containing High Amounts of Piceatannol Inhibits Melanogenesis and Promotes Collagen Synthesis." J. Agric. Food Chem. Journal of Agricultural and Food Chemistry 58.20 (2010): 11112-1118. Web. 2. Murias, Marek, Norbert Handler, Thomas Erker, Karin Pleban, Gerhard Ecker, Philipp Saiko, Thomas Szekeres, and Walter Jäger. "Resveratrol Analogues as Selective Cyclooxygenase-2 Inhibitors: Synthesis and Structure–activity Relationship." Bioorganic & Medicinal Chemistry12.21 (2004): 5571-578. Web. 3. Chang, Jiunn-Kae, Ya-Ling Hsu, I-Chun Teng, and Po-Lin Kuo. "Piceatannol Stimulates Osteoblast Differentiation That May Be Mediated by Increased Bone Morphogenetic Protein-2 Production." European Journal of Pharmacology 551.1-3 (2006): 1-9. Web. Nice. Purchasing 2 bottles of GenoFlex and hope it will help with my shoulder and knee. After all, the feedback has been only great so far.